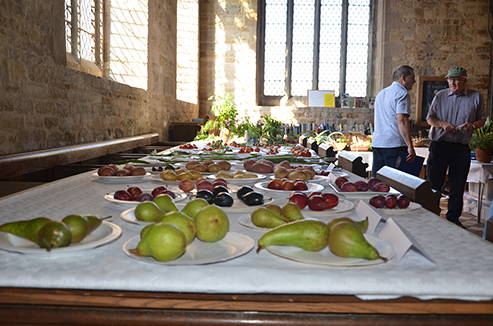 Last year there were a total of 167 exhibits in the Vegetable and Fruit section of our annual show. That was a great achievement considering the challenging weather conditions in 2018, with a cold wet spell in spring, followed by a long summer drought. This year there are four new classes, Brassica, Dwarf French Beans, Tray of three root vegetables and Heaviest Tomato, as well as many old favourites. This is a good time of the year to start planning ahead. If the weather is fair and the ground is not too wet, begin preparing the ground. Dig in well rotted manure or garden compost. Now is also a good time to check the seed catalogues, or search online for your chosen seed varieties, ready to sow in the spring. If you have limited outdoor space many of the vegetable and fruit classes can be grown successfully in pots in the garden or on the patio. Remember to feed your plants regularly once they are established. This is especially important if grown in pots as they will quickly exhaust the nutrients in the compost. Also check for pests regularly and deal promptly with any you find. Any classes asking for more than one item will be judged on condition and uniformity, shape, colour and size, so make sure you select your exhibits carefully. Let’s hope we have a fine spring and summer and produce some great vegetables and fruit. Whissendine Craft and Produce Show Committee. For more information, visit the Craft & Produce Show page.